Mozilla launched in-content tabs in Firefox 15 to get away from the settings window that opens up when you click on options in the browser. 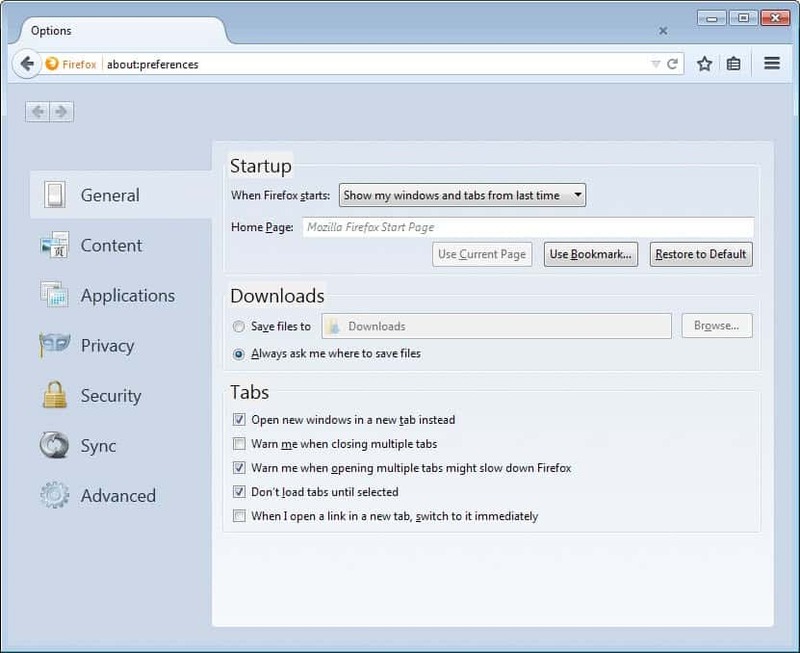 With Firefox 32, Firefox will load preferences in a tab by default. When the new feature launched back in 2012 it had a lot of issues. Probably the biggest one was that you the main menu options were not displayed on sub-pages which meant that you had to click back to go to the start page to open another menu from there. Mozilla worked on the design and the most recent version of it was launched just two months ago. It displayed all menu items on the left in a sidebar, and the settings of the selected item on the right. With Firefox 32 comes another change, the new in-tab preferences are on by default, which means that whenever you hit the options button in Firefox they are opened. One thing that you may notice is that the new layout requires more space on the screen as the old. While that should not be a problem on most systems, it may mean that you need to scroll to read and change all preferences on the screen. Zooming does work here on the other hand so that you can adjust the text size accordingly. It is interesting to note that you can load about:preferences in all supported versions of Firefox to display the options in a tab. You will however notice that the design and layout may be different. This is for instance the case when you compare the preferences design of Firefox 29 with that of Nightly 32. The change takes effect when Firefox hits version 32 if things go according to plan. Nightly is already on that version, which means that all Firefox channels will be migrated to the new design over the course of the next three release cycles. This sets it to false so that preferences are not displayed in a tab anymore but in a window just like before. Mozilla will enable in-content preferences in Firefox 32. This article looks at the change, and offers an option to restore the old preferences window. Just go to about:preferences. Even so, there are still some modal windows in 29 for some things, but mostly it’ll look pretty much like AOM. Unlike the modal windows, just sitting on a tab here uses CPU and I/O–continually polling for modifications having been made to settings. Nice to see Firefox adding this feature, this could really speed up surfing with Firefox. I’ve made bookmarks to all of my favorite about:config settings. For this one use Preferences In Popup Window as the name and about:config?filter=browser.preferences.inContent as the URL. This greatly reduces setup time if you need to reinstall Firefox. The problem with the tabbed preferences is the access tab for https://addons.mozilla.org/en-US/firefox/addon/customizable-shortcuts/ addon doesn’t show up in it. You have to use Preferences in a popup. Using this with GMail with Firefox 28 and 29, it “breaks” my ability to use Control-b for BOLD and Control-i for italics etc when composing a gmail email. When I turn off the add on, I get my control-b bold and control-i italics back. And I think they should make the same thing with the Download Library. Someone else? Really don’t know why that was introduced. A problem with that new tabbed view is that shortcut keys don’t seem to work. Some letters on the buttons are underlined, but pressing Alt and that letter does not activate them. Need to do point and click, which can be time consuming. Reverted to old display and pray it stays accessible in future versions.